Saina Hotel of Tehran Saina Hotel has secured a special place among hotels in the capital. 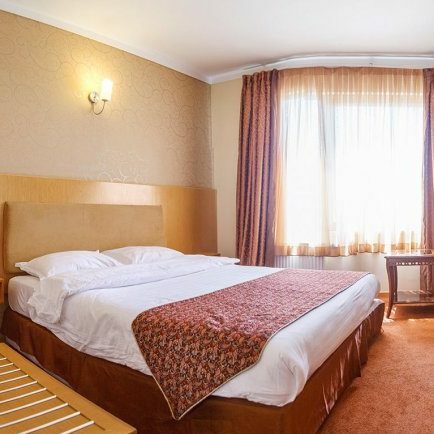 Saina Hotel is a good choice for all travelers with their different purposes, as it has easy access to various bureaus and commercial centers along with the sights and the city center. You will be instantly mesmerized by the elegant decoration and the clean and pleasant rooms of this hotel. The atmosphere is quite cozy and peaceful, taking you away from the hustle and bustle of the capital. The welfare facilities are quite perfect as well. The coffee shop with a varied menu, the equipped business center, and the healthcare facilities, etc. are among the many privileges of this hotel. A unique feature of this hotel is its easy access to Valiasr Street. Valiasr Street acts as an artery in Tehran’s transportation system, and if you have access to this street, you can get to any district in Tehran. Using public transport vehicles such as B.R.T., subway and taxis can cut down on expenses to a great extent. In case you’re concerned about all the noise coming from the streets, worry no more. Being located in back alleys has made this hotel immune to the hustle and bustle of Valiasr Street. "